It’s just like cooking scrambled eggs! I love food probably even more than I love art! So it is no wonder that I often use analogies or similes in my visual arts teaching that revolve around food. For example, I often use the terminology “ingredients of an artwork” or an artwork’s “recipe” when discussing or referring to the elements and principles of art. When teaching, we often introduce concepts that our students struggle to understand and so explaining something in terms or by using a comparison they may understand can make the world of difference. The other day whilst teaching, I was showing a class a painting by Vincent vanGogh and discussing his different way of using brushstrokes which was going to be the focus of the lesson. A rather impatient student in the class put up his hand to ask a question. He asked me why we had to look at the picture and when we were going to start painting our own. Rather than be upset or frustrated with the student, I saw this as an opportunity to impart some food-simile related wisdom. 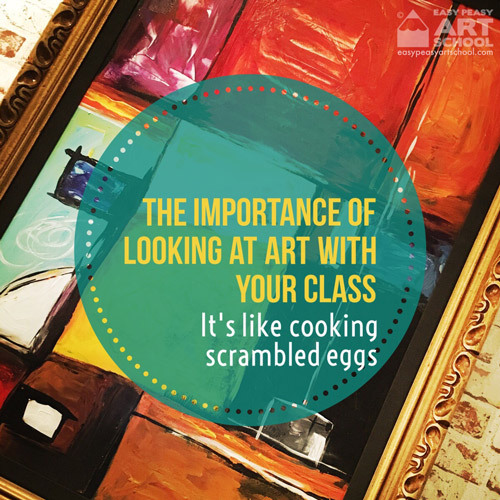 I began by explaining to my class that I love to cook. I especially love to cook scrambled eggs. Every Sunday morning I get up, make some coffee and cook my scrambled eggs. I have always believed that my scrambled eggs are pretty damn good and I have always made them the same way. I would have probably continued to make my eggs the same way except for the fact that a few Sundays ago instead of cooking my eggs I went out to a cafe for breakfast, where guess what, I ordered scrambled eggs! When my order arrived and I began eating, I had to admit that these eggs were the best scrambled eggs that I had ever eaten. There’s not much that goes into scrambled eggs, so as I ate I decided I would work out what the chef had done differently to me to make them so great. I decided that what made the difference was the way that the chef had gently folded the eggs rather than scrambling them all up. It was also the small addition of some herbs and olive oil drizzled over the top. Whilst making myself hungry reliving the story, I also then went on to explain that the following Sunday when it came time to cook breakfast, how I incorporated my new favourite eggs into the way I made mine. Whilst my old eggs were great and It would have been ok to keep making them the same old way, it was also great that I got to see how someone else tried to cook the same thing. By looking at and experiencing the way that other people do things be it cooking or art we can learn new ways of doing things to improve the way that we do our own.